Thomas and Lily often visit their grandparents who live in the Rocky Mountains. We quite like the Bramble Berry Tales books: The Story of Kalkalih and The Great Sasquatch. Made to promote languages that are near extinction, these books are full of cultural knowledge and positive moral messages. Despite belonging in the same series, each book can be enjoyed on its own. The latest to join the interesting series is The Little People. It tells of the mysterious little people who roam the forest near the Rocky Mountains, where protagonists Thomas’s and Lily’s grandparents live. Like all other Bramble Berry Tales, the story starts with Thomas and Lily visiting their grandparents, Mooshum and Kookum. Kookum tasks the siblings to gather some soapberries to make ice cream, while she and Mooshum leaves to catch some salmon for dinner. Frustrated of waiting for Lily to get ready, Thomas decides to go outside to find the berry buckets. Lily is in fact trying to grab the last piece of her grandmother’s delicious bannock from the kitchen shelf, when she accidentally falls off the chair. Rather than hitting the floor, she is caught by a mysterious little man. He has a grown up look, but only a waist high and has no nose. He makes a mess in the kitchen, and leaves Lily to take the blame when Thomas returns. Thomas leaves Lily to clean up while he goes to collect the berries alone. But when he approaches a soapberry bush, the berries suddenly pop out! When Lily finally catches up to him, he tells her that someone must be playing a prank of him. Suddenly, the same little man that appeared in the kitchen shows up in front of them. Lily chases him into the forest, but she stumbles on a tree root and hurts her ankle. With their berry buckets still empty, the kitchen a mess, and Lily’s ankle hurting, how are the siblings going to return home and face their grandparents? The Little People is a lovely tale filled with many lessons. Throughout the book, kids can tap on a highlighted words and find out how it is pronounced in the traditional Cree language. There is also a personal note from Mooshum describing the word. The book also contains many pop-up descriptions. 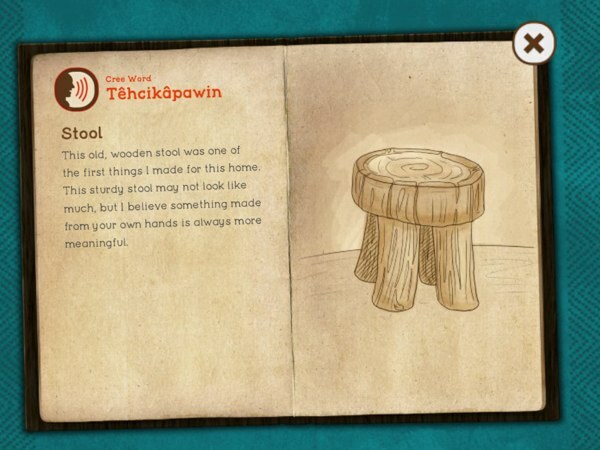 These little lessons are written in first-person by Mooshum, and provide kids with details about the story. I recommend accompanying your kids as they read and get the most out of this book. The app supports three reading modes. It is available in several languages, including Spanish, French, and the original Cree language. Kids can tap the highlighted words to bring up informative pop-ups. As expected from a Bramble Berry Tales storybook, The Little People also features beautiful illustrations and animations. The professional voiceover for each character bring the story to life, and the interactive features add to a fun reading experience. The story flows nicely, although a little slow during the first half. It takes a while to build up the mystery behind the little people, especially from the perspective of young readers, but it’s a worthy effort. The extra illustration and animation makes up for the wait. Who is the mysterious little man that keeps showing up in Thomas and Lily’s ways? The Little People is a lovely storybook for kids ages 3+ who loves to read fairy tales. It nicely rounds up the Bramble Berry Tales trilogy. I really love the characters in the series, and wish there were more stories written using these characters.